Chateau / Country House7534 sq. ft.
Manor house inside of 11400m2 garden. 9 - 13 persons, 700 sqm houses, , private tennis court, private (pool 12x6m)— private heated relaxing pool (3x3m), pool house, chapel - etc. Main house - floor: 1 reception hall/ living room with fireplace, 1 dining room, 1 fully equipped kitchen — 1 double bedroom with AC and bathroom en suite — 1 twin bedroom with AC and bathroom en suite downstairs floor: 1 living-/games room with Sat-TV and Billiard, 1 double with bathroom en suite, 1 twin bedroom with bathroom en suite, 1 single room and 1 shower/wc. stable suite: 1 living room, 1 double bedroom with AC, 1 shower/WC, Underfloor heating, and freezer. Garden suite: 1 living room, 1 twin bedroom with AC, 1 shower/WC Underfloor heating and freezer. Pool House: 1 fully equipped kitchen,1 dining room,1 changing room,1 shower/WC. Solar de Magoito is a unique place of leisure and well-being. Located in the Sintra/Lisbon coast and set within the Sintra-Cascais Natural Park. Magoito is a village located on Sintra's coast : Magoito is a small village located on Sintra’s coast and within the Sintra-Cascais Natural Park. 10km away from Sintra’s historic center (UNESCO World Heritage Site), Sintra’s coast is characterized by a wood vegetation of Mediterranean Stone-pine. The strong patch of these tree canopies, seen from a high point, dazzles by his imposing green close to the blue of the sea. Its closeness to the capital (Lisbon), to the enchanting Cascais town and near the romantic Sintra (UNESCO World Heritage Site) makes possible an endless activities program. From the inexhaustible historical patrimony, (palaces, castles, museums, etc. ), to the fantastic program of artistic and sport events taking place throughout the whole year between Sintra/Cascais/Lisbon, Magoito is without doubt a place of enchantment. Solar de Magoito: From Solar de Magoito comes in sight, on the horizon, the contour of Sintra’s Mountain with the Pena Palace on top. This palace’s park has a fantastic and exuberant flora with species from the various continents of the globe. This coast’s beaches are followed by magnificent cliffs of sedimentary rock formations. Magoito is located in the North zone of this littoral, enjoying a dazzling view of all the beaches that extend to Cabo da Roca (Continental Europe’s westernmost point). The Lisbonians, from the beginning of the twentieth century, and most recently the international tourism, elected this region as a holiday destination. The mild climate, the very rich flora, the fantastic beaches, the regional gastronomy and closeness to the distinct geographical and cultural realities of the Sintra/Cascais/Lisbon - gold triangle - makes this a delightful area for those who visit it. Bird and plants watching (there are 20 different types of fruit trees to discover in the property). A variety of birds is a constant presence in this Natural Park and Solar de Magoito is a desired area for its habitat. For children, the challenge of wood/pine-wood and garden area; space for ball games and playground with swing and slide. Available personal trainer/walk and cycling guide and surf monitor. Hiking with a guide. A walk through 7 beaches of the county is the delight of visitors. Bicycle tours (the property has bicycles available for free). Guide available. Beach (Surf/Body board/Fishing). There are surfboards available for free. Surf monitor available. Para gliding (is frequent the practice of this modality on the beach cliff). For booking we ask for 30% deposit and the balance two months before arrival day. Security refundable deposit 1000 when all property are in exclusive. 11000m2 garden Swimming Pool 1 (main pool 12x6) Depth 0,8m/1,7m Covered relaxing outdoor pool 3x3 Depth 0.6m can be heated to 32°C Kids playground Pool Towels Tennis Court Tennis racquets and balls provided Table Tennis Snooker Table Bicycles 2 (free) Surfboards 2(free) Available personal trainer/walk and cycling guide and surf monitor Parking Double Barbecue Kennel & dog run (dogs accepted on request) Bird and plants watching (there are 16 different types of fruit trees to discover in the property). A variety of birds is a constant presence in this Natural Park and Solar de Magoito is a desired area for its habitat. For children, the challenge of wood/pine-wood and garden area; space for ball games and playground with swing and slide. The property is well presented and very comfortable. The grounds are very expansive and much bigger than the web site suggests. The pool and adjoining outside kitchen/dining /lounge area were lovely and the ennis , oing pong and pool ( table ) were enjoyed by all. We really enjoyed the house and facilities. We stayed in the beautifully maintained property for a week with a group of 14 family members--from grandparents to young children. The living quarters were modern and spacious. Bedrooms and bathrooms were excellent. Some of us played lawn tennis, table tennis and pool while others lounged at the main pool or wading pool. Manuel was easy to communicate with and offered great suggestions for restaurants in the area. He came over very quickly when he needed anything, which we rarely did. 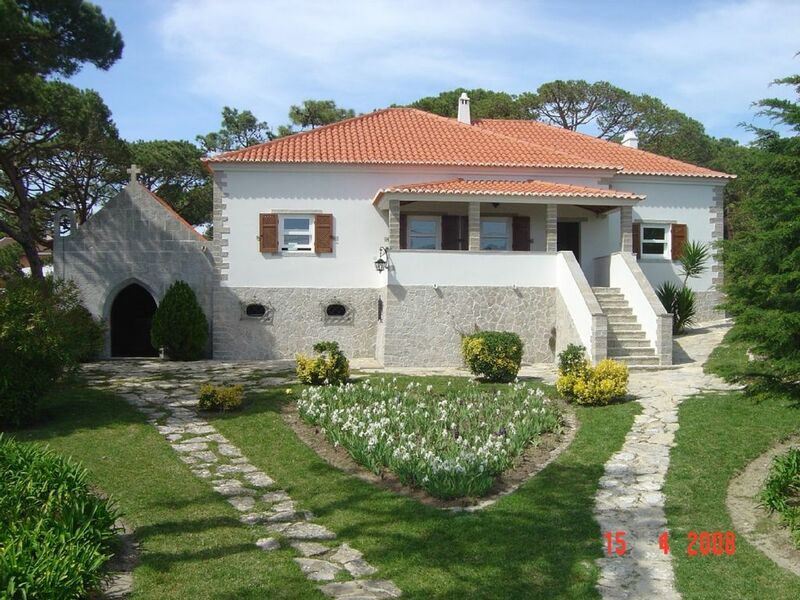 The property is within 30 minutes or less to Sintra and Lisbon. The town of Magoito itself is small but has cafes and a take out place or two. We loved coming back to the property after day trips to the sights nearby and enjoying the activities and relaxing in the beautiful grounds. I would highly recommend it! We spent a week in Solar Do Magoito and we loved it. Our group consisted of 6 adults and 9 kids and there was enough space for sleeping, playing, resting and enjoying life. We love to cook outside and the bbq -place was very good for us as well as pool house with a fire place! Kids enjoyed playing tennis, billiards etc on a huge garden. The beautiful beach was only 1 km far from the house and it was reachable either by car, walk or bike. Very handy! There was also a nice restaurant with a perfect view. The host Manuel was very helpful and friendly and always available if needed. We suggest this house for everyone who are looking for a nice holiday hideaway! What a gorgeous property! You will want to stay longer in this wonderful, quiet property that is set up so that you wouldn't need to leave if you didn't want to. Rental cars recommended, as the walkable surroundings don't have extensive amenities. Beautiful kitchen, pool house, all bathrooms have intricate Portuguese tiling, etc. Very comfortable for our group of 11 adults, and the external stand-alone house was good for Grampa with limited mobility as the shower didn't have a step-in bathtub. From the moment we arrived, we were made to feel welcome. This beautifully maintained walled-estate has everything you could need to relax: lovely grounds, pool & hot tub, side-by-side stone BBQs, a quick walk to the beach, and enough lodging space to get away from everyone! Manuel, who greeted us, is very gracious and helpful. Speaking good English, he is a good source for things to see and do. The house is very close walking distance into town for restaurants and there is a grocery store very near with everything you could need. The kitchen is modern and complete with all necessary appliances/tools for cooking (but you will need to provide your own food, herbs, spices, condiments, etc.). Each house had plenty of plates, glasses, cutlery, etc for us (there were 11 of us, but I feel this property could easily handle many more). The floors to our bathroom were heated (!) which was a joy as the Spring mornings were cool and there was a heated towel rack. There were many heaters spread around the house. The house is very traditionally decorated with gorgeous tile work on the walls & floors, and lovely wood paneling. Laundry was easy and although there was a dryer function, we hung our clothes in the sun to dry very quickly. We used this as a base for many day trips to see Sintra, Lisbon, Ericeira, Cabo de Roca & many others including as drive up to Porto. Check out was not rushed: we were allowed to take as long as we needed. Manuel was always available throughout our stay by phone/email to answer our many questions. His friendly nature ensured we all enjoyed a relaxing vacation. Beautifull Houses on a great Location! We visited Manuels beautifull House with 14 people, mainly adults. We really enjoyed the houses and the poolhouse was a great central area for everyone. The area is very nice as well and Manuel took good care of us a great Holiday thanks again! From Solar de Magoito comes in sight, on the horizon, the contour of Sintra’s Mountain with the Pena Palace on top. This palace’s park has a fantastic and exuberant flora with species from the various continents of the globe. This coast’s beaches are followed by magnificent cliffs of sedimentary rock formations. Magoito is located in the North zone of this littoral, enjoying a dazzling view of all the beaches that extend to Cabo da Roca (Continental Europe’s westernmost point). Lisbon people, from the beginning of the twentieth century, and most recently the international tourism, elected this region as a holiday destination. For booking we ask for 25% deposit and the balance two months before arrival day. The rates on top are just for the solar (manor house 9 people). Suite cottages has an extra price in high and top season 100 euros each one per night and in low and middle season 80 euros (11 or 13 people) Refundable Security deposit 1000 when all property are in exclusive. Extra beds are possible, 25 per night each one.